Plenty have warned The Doctor about the Pandorica but here he is. Inside it holds the greatest warrior in the universe and everybody wants control of it, including the Daleks. This is Part One of the Season Five finale. What did you think? Were you shocked by anything? Do you think they're all doomed? Is this the end of the series? (It's not.) Do you kinda want to go to Stonehedge and scream at the stars? I watched these a couple weeks ago but as per the rules, I watched them again. I love this two-parter. It never gets old. My favorite part is when all the ships are flying around and the Doctor is all like "I'm the Doctor. Do you really want to do this?" And they don't and leave. So cool! Doctor! It's fun to see all the baddies working together against the Doctor. And even better, they're doing it in an attempt to save the universe. They may be misguided and wrong but you have to give them credit for trying. I just watched this a couple weeks ago as well, but per the rules, am watching it again. I'm okay with it because it's awesome! I love how much is built up to what's inside the Pandorica. What could be worse than the Daleks? The Cybermen? All of the Doctor's enemies? Naturally, the Doctor himself! I also love their realization of how many starships are flying overhead and how the Doctor has the power to sit there and scream at them all and make them listen. The thing that's interesting about the Daleks in this one is that they're teaming up with other baddies to achieve their goal. How very not Dalek-like of them, but like I said in a previous post on some thread...the Daleks are okay with seeing the universe burn...but only at their hands. They definitely don't want the Doctor to be the one who does it! I love: "They'll never never expect 3 people to attack 12,000 Dalek battleships! Because they'd be killed instantly. Never mind." Hello sweetie… I love this episode! It’s so much fun from beginning to end. In the beginning, the Doctor is just trying to figure out what is being kept inside the Pandorica, until he finally realizes it is to keep him inside. (DUN DUN!) Who would have thought that all these creatures/aliens would have joined forces and come together to lock up the Doctor. But they thought they were trying to save the Universe from ending, so I guess that’s a good reason to put your troubles aside. 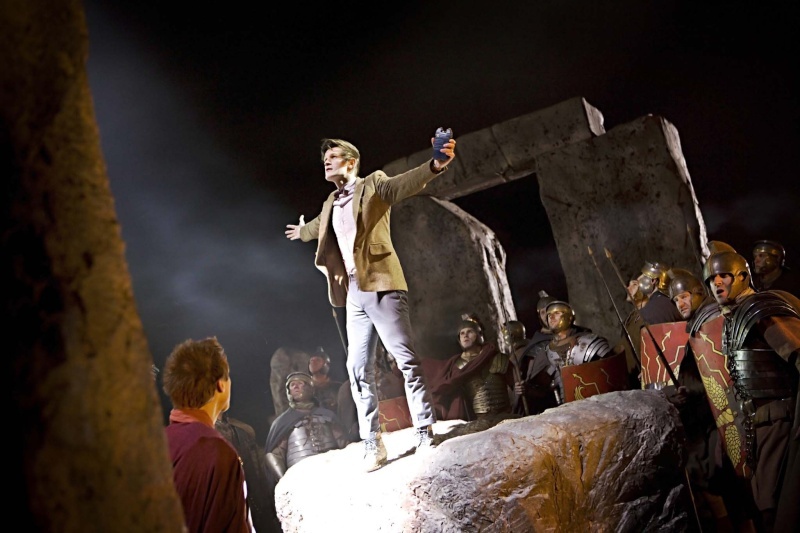 The best part is the Doctor’s monologue when he is talking/yelling to everyone in the middle of Stonehenge. It's a great scene. P.S. I think the Doctor looked the most scared when he noticed the Daleks. Hehe. this was a great one. seen it like 5 times this year, but whatever, always fun. Totally called that the worlds greatest warrior was the Doctor. Rory comes back, but then he kills Amy which is lame, but the ultimate prison is also really good at healing so woo! now what?